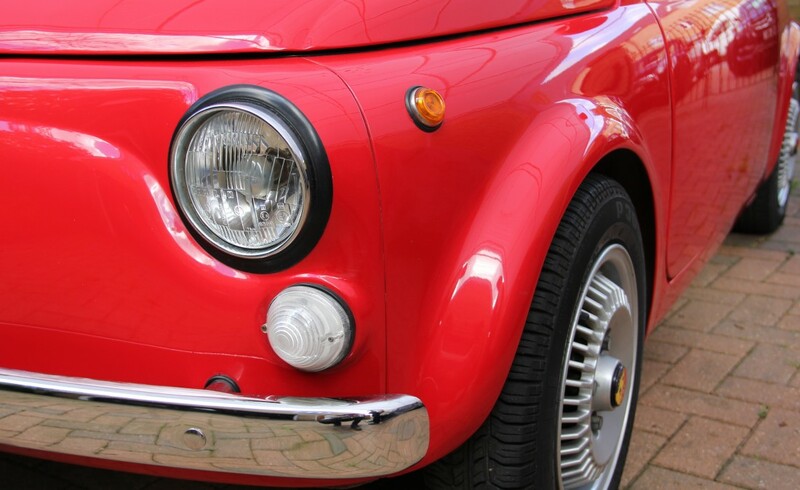 With the launch of the new Fiat 500, a car designed by Dante Giacosa around the principles of simple construction and low production costs, Karl Abarth created the legendary Fiat 500 Abarth. 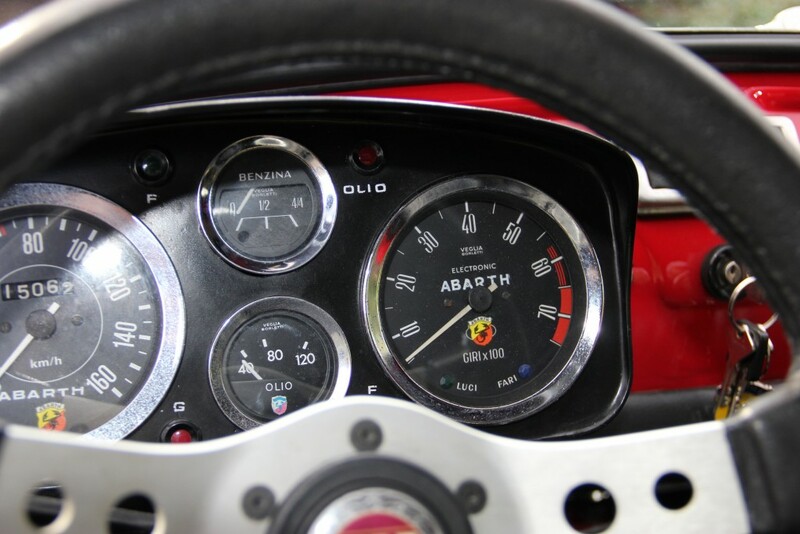 Although the car featured near-standard bodywork, the 479 cc engine’s compression ratio was increased (from 6.55:1 to 10.5:1), a Weber 26 IMB carburettor was fitted, and the intake and fuel systems were optimised. Together with a tuned Abarth exhaust, power was now up to 26 bhp (from 13 bhp), and a number of cars were sent to the Monza circuit for testing. Karl had proven that small runabouts could be used as the basis for fast and reliable racing cars, and for them, a new phrase was coined: “small but wicked”. 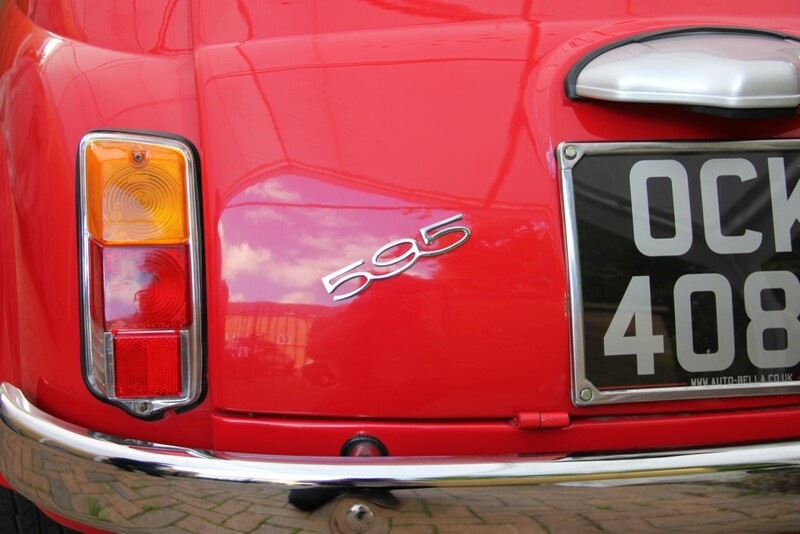 This gorgeous 1969 Fiat 500 was restored with the intention of creating some revocation of a 595, hence the modifications which the vehicle has undergone in order to achieve so. 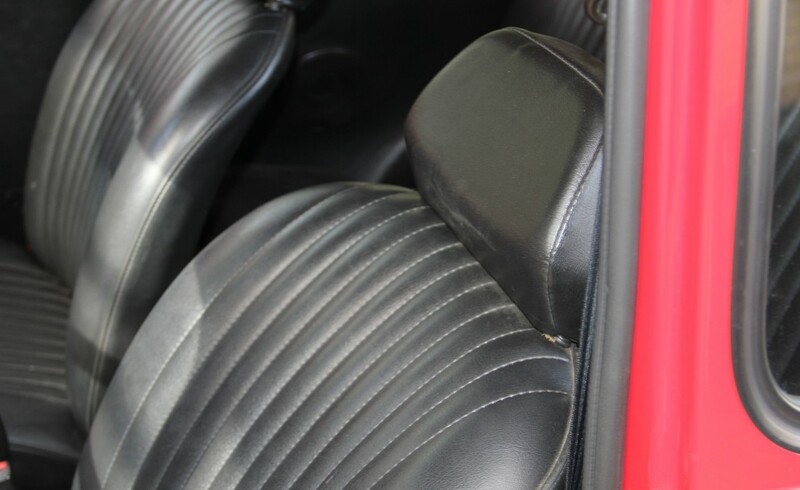 Also some refinements and nowadays ‘luxuries’ have been fitted to the 595 in order to have a unique and customised classic which can be used every day. 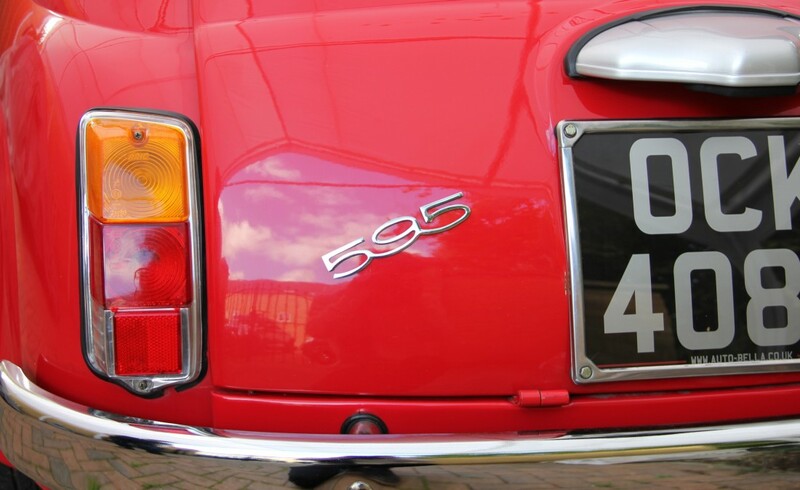 With a desirable ‘F’ shell and a 2 owner history, this Fiat 500 is also a solid investment for the future. 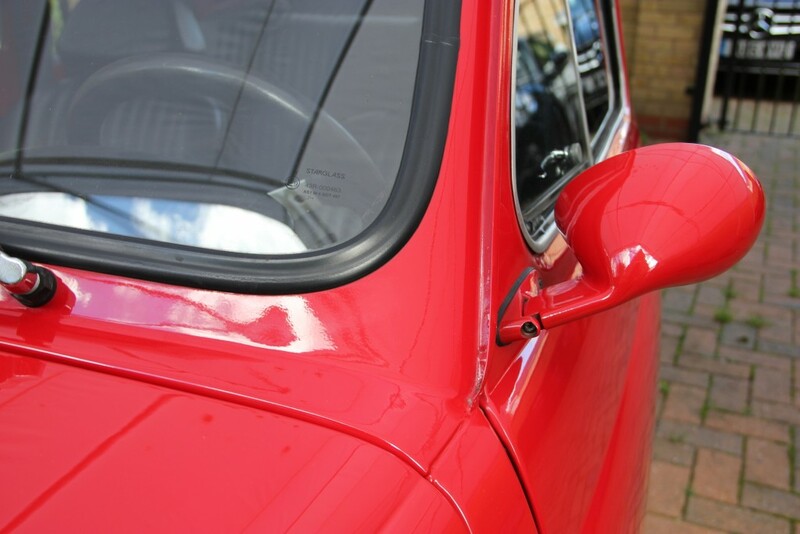 The vehicle had undergone a frame-off restoration: countless hours of panel beating and preparation ensured the most of the panel work is original. Further preparation with modern materials ensured a long lasting restoration with anti-corrosion and anti-rust agents been applied to the car before painting. 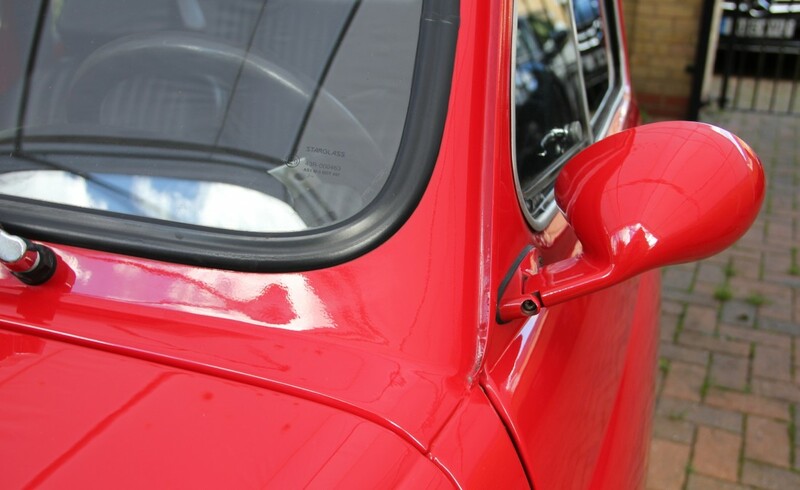 Ferrari Red is the colour that was chosen to wrap such a beautiful and smooth shell, it was then buffed and smoothened further to really show off the quality of the restoration. Originality of parts was key while restoring this 500, therefore most of the chromed parts have not been replaced but in fact rechromed to today’s 3 layer 35 grams high quality chroming. – Wide alloy wheels with Abarth decals. – ‘595’ Badge on the engine bay. 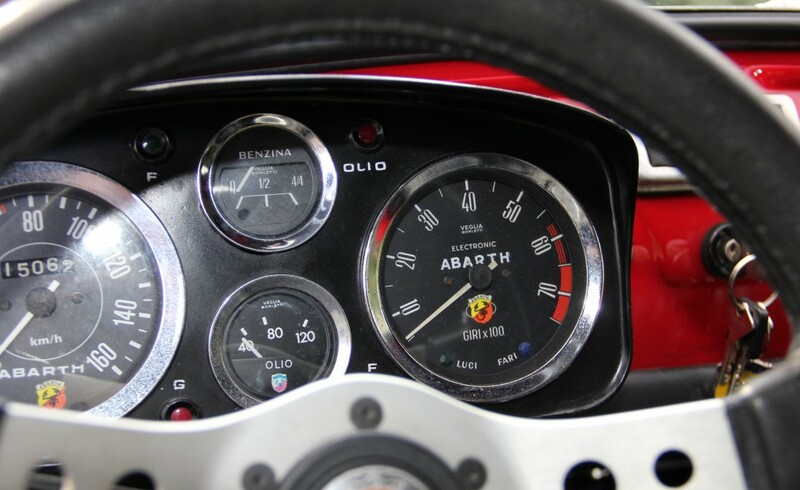 – Abarth ‘vent-holed’ badge on the front. – California styled wing mirrors. – Metallic silver number plate light. The same attention to detail – if not more – has been put into rebuilding and elaborating the mechanics. Engine and transmission have both been uncoupled from the body and been overhauled. The whole block had been drained and polished, following a cylinders expansion to 595cc. Polished piston rods, a modified cylinder head and an elaborated oil system ensures a more compressed cycle, hence a more powerful engine. Substituting the original Weber 26, a Dellorto 28 carburettor was fitted enabling the 595 to have a quicker, nippy and more fulfilling throttle response. The distributor’s points were substituted with a modern electronic ignition system, this enables a more precise timing and a virtually inexistent maintenance of the distribution system. 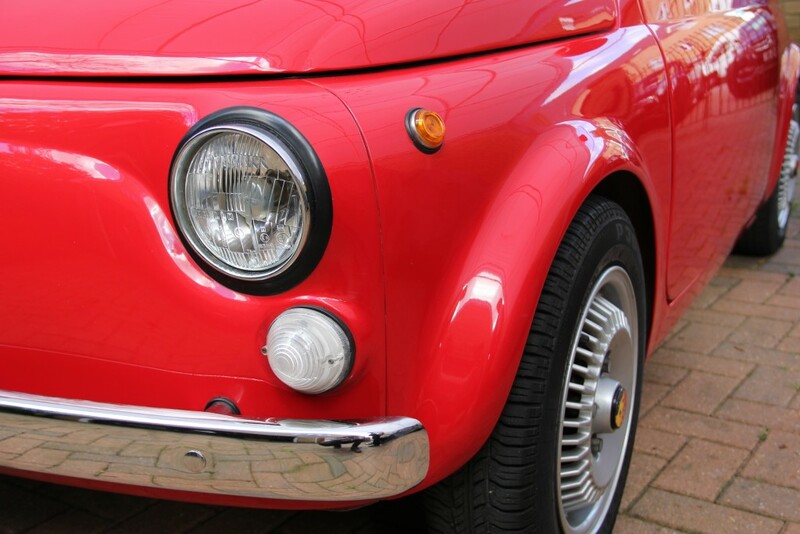 Coupled to the pocket rocket is a fully overhauled Fiat 126 synchronised transmission, which has been re-engineered by Italian craftsmen to add a customised 5th gear to the box, enabling not only a higher top speed, but also a more comfortable motorway ride. Every gear slots in place perfectly, making a very satisfying ‘click’ noise once in place. Topping this elaboration is a handmade sports exhaust which captures the catchy notes of the performing 595cc. Detailing of the engine was also a big deal – with powder coated panels, Abarth 4.5L aluminium oil sump and Abarth aluminium valve rocker cover, no 500’s engine bay in the whole UK looks this clean. 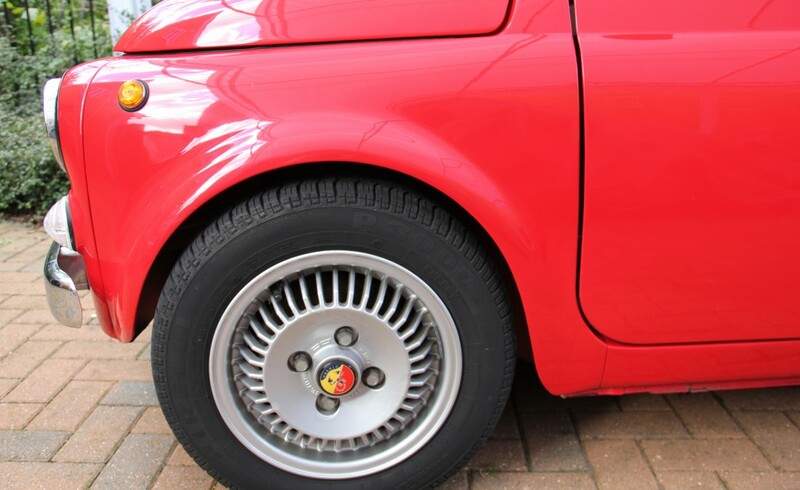 The braking system was also re-engineered: 2 front discs and 2 rear widened Fiat 126 drums replaced the old brakes. The lowered suspension kit further aids the handling of the car: lower and firmer springs give the driver the confidence of throwing the pocket rocket round roundabouts and lower the centre of mass for enhanced stability. The interior of the vehicle was designed and crafted with excellent taste and not a single screw feels cheap or unthought of. 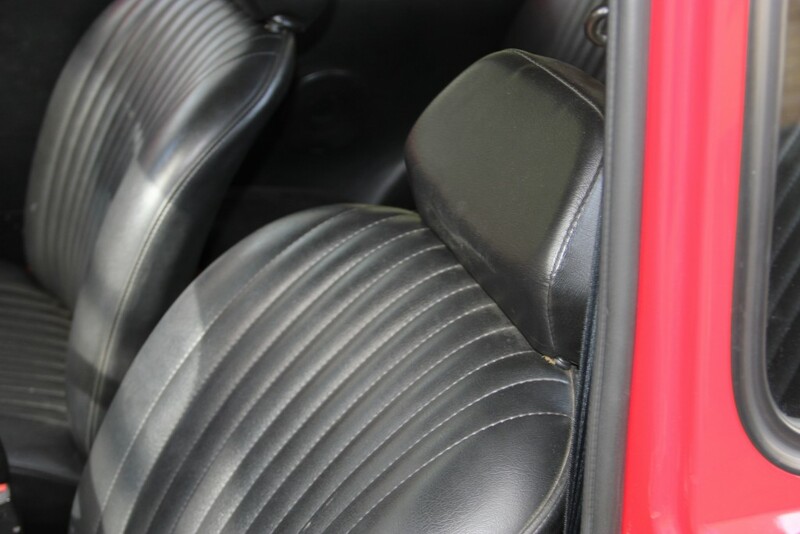 Most of the interior in fact was replaced with OEM parts or restored to modern standards. The seats have been re-foamed and restructured with brand new springs and covers. Door cards, carpets, door pockets, door handles, window winders have been replaced with brand new parts. 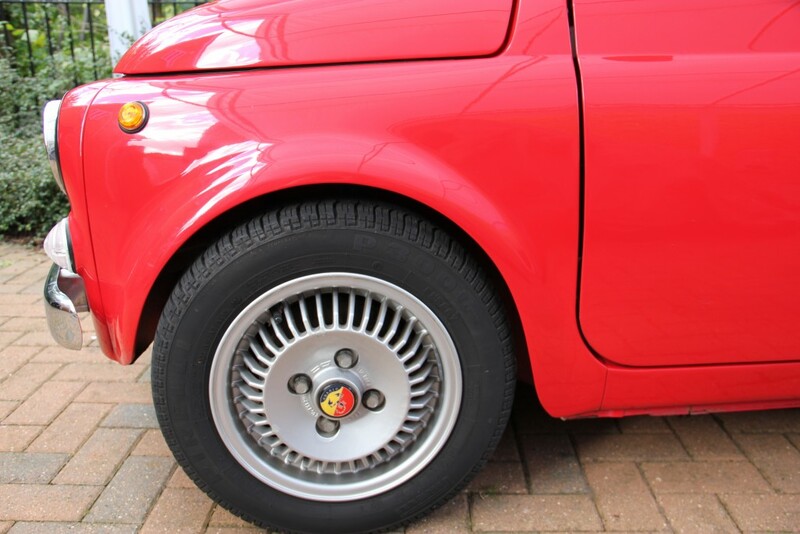 This Fiat 500 has undergone a great deal of customised engineering and interior design before being put back together and many hours of work have created something which to us can be described as a ‘mini sports car’ to drive every day. Great handling, a fun smile-factory accelerations and it gives thrill of seeing roundabouts. MOT’d freshly in September 2016, this car comes with scans of the original documentation, V5, black number plates and a fresh AutoBella service. Please do not hesitate contacting us if any questions may arise. Contact the sales team today to book a test drive!